The City of Immigrants supports the study of immigration, the labor movement, and cultural identity in the American History curriculum. 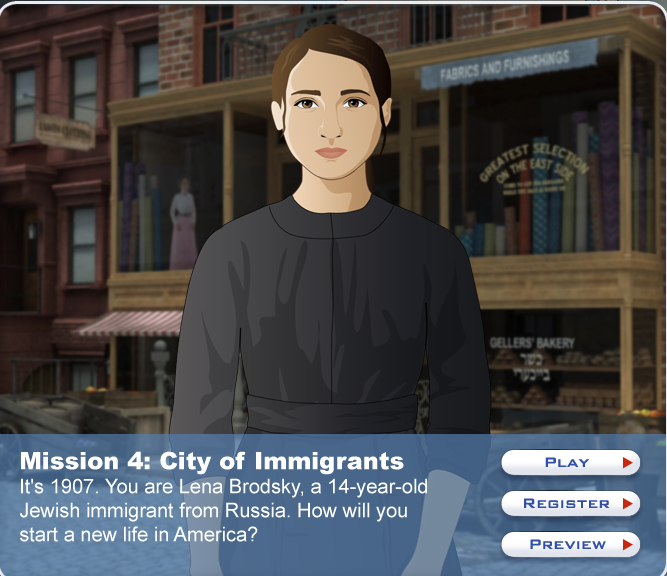 The game put players in the role of Lena Brodsky, a 14-year-old Russian Jewish teen who has recently immigrated to New York City in 1907. As Lena makes the Lower East Side her home, she struggles to support her family and becomes part of the growing labor movement. The game is the fourth interactive experience in the award-winning Mission U series of free, digital role-playing games created to engage middle and high school students in the exploration and understanding of U.S. history. OUTCASTED – a social impact game that puts players in the shoes of a homeless person – is the winner of the Games for Change Students Challenge, an initiative by Games for Change Europe, Autodesk and Unity Technologies that aims to leverage important societal topics through the means of games. Here is Habit RPG and here is a video explaining more about the project.. The ‘Camover‘ movement is spreading across the country..
..despite the fact that there’s no real prize; scores and bonuses for destroying CCTV cameras – that’s what you get if you play this new ‘reality-game’ in Germany. To participate in Camover, players form a team and give it a name – the ‘brigade’ part seems to be a must – and then go around town destroying CCTV cameras. The process has to be taped and posted online. Each team gets point for the number of destroyed cameras, as well as for creativity of execution. The moral and legal concerns associated with the willful destruction of property in the real-world make this much more than a “game,” and the creators admit that it’s a serious matter. Camover’s anonymous founder tells The Guardian, “although we call it a game, we are quite serious about it: our aim is to destroy as many cameras as possible and to have an influence on video surveillance in our cities.” Camover ends today, on February 19th, the day that the European Police Congress starts.